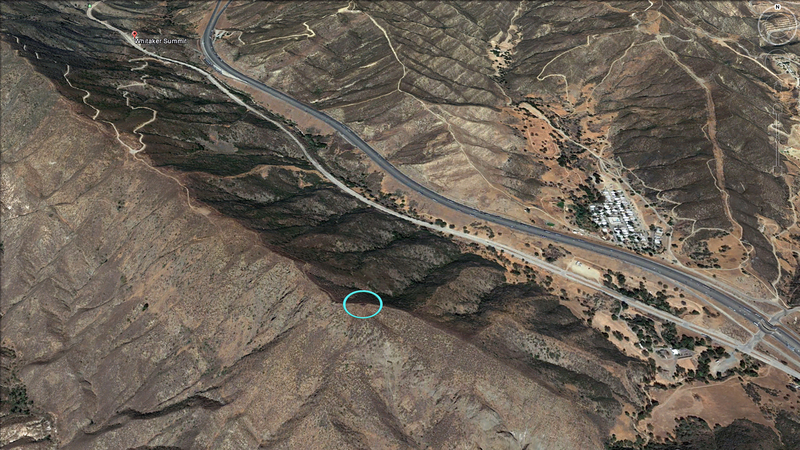 SCVHistory.com | Tataviam Culture | Investigation of Damage to Paradise Ranch Knoll Earth Oven, Castaic Area, 2009. Paradise Ranch Knoll Earth Oven Site. Investigation of CA-LAN-2464 in Response to Site Damage Resulting from 2006 Day Fire. Darrel W. Vance | USDA Forest Service, Angeles National Forest | 2009. Above-ground features of the earth oven were obliterated by bulldozers cutting fire breaks during the 2006 Day Fire[*], the 1996 Marple Fire, and probably earlier fires. According to the post-Day Fire report, the site's location on a narrow saddle "makes it nearly unavoidable" as an anchor point for mechanized equipment. Firelines that have proved crucial in the past tend to be reused. The earth oven site was discovered during the 1996 Marple Fire when a bulldozer "reopened a mechanical fireline along the ridgeline, striking the deposits." In the subsequent investigation, "it was noted that the dark carbonized soil and FAR (fire-affected rock) were widely scattered on the surface, and that some of the rock had been crushed by bulldozer tracks." As noted in the post-2006 Day Fire report, wildfires can irreparably harm cultural resources by burning them, and the resulting mudslides can wash them away, but "fire suppression measures, such as the mass movement of earth during the creation of firelines, often are the primary cause of adverse effects to cultural resources. These processes may alter the context of archaeological remains vital to analysis and interpretation and have potential to completely destroy the resource." 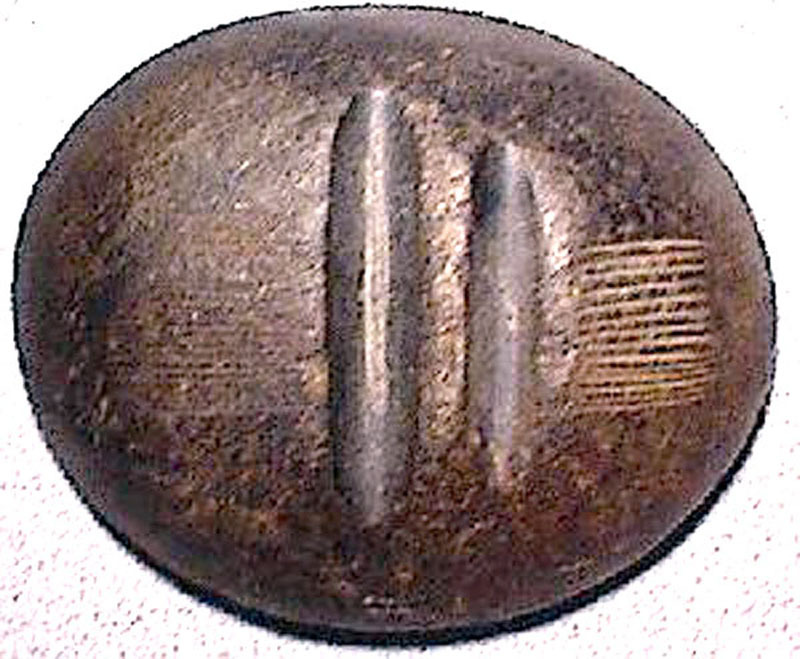 After the 2006 Day Fire, charred material was radiocarbon-dated to ~1530 years ago (as of 2009), which roughly coincides with the arrival of the Takic-speaking Tataviam people from the Great Basin. Earth ovens in the Tataviam sphere were used primarily to cook yucca. While acorns, seeds and small game were dietary staples, "it is widely regarded that the Tataviam relied more heavily on yucca (Y. whipplei) as a major staple than did neighboring peoples." Baking yucca stalks resulted in "a rich, molasses-like food," while the "leafy basal rosette of the plant, which has a consistency similar to artichoke, could also be roasted." "The oven began as a pit excavated with digging sticks, generally measuring approximately 1 meter deep and about 2 meters in diameter. Large firewood was compactly placed into the resultant cavity, on the firing surface, and set alight and allowed to burn to create hot coals. When the oven was thoroughly heated, the fire was raked out and partially covered with stone or dirt to about ground surface level. A small hole or aperture would be left clear in the middle of the pit to retain oxygen, and then the sand or earth tamped down to level, causing flames to shoot out of the hole. The yucca would be placed on the resulting cooking surface, wrapped or layered in wet green vegetation. The feature was then banked over with an earthen mound, which might initially reach a height of over 1 meter, to contain the heat. The mound would partially settle during the roasting process. The food was left to cook in the stored heat in the oven for one to two nights. Subsequently, cooked yucca hearts were extracted for further processing, in which they were dried, ground, and mixed with water to form cakes for storage." Earth ovens weren't usually located in villages; rather, they were located near (yucca) harvesting sites. 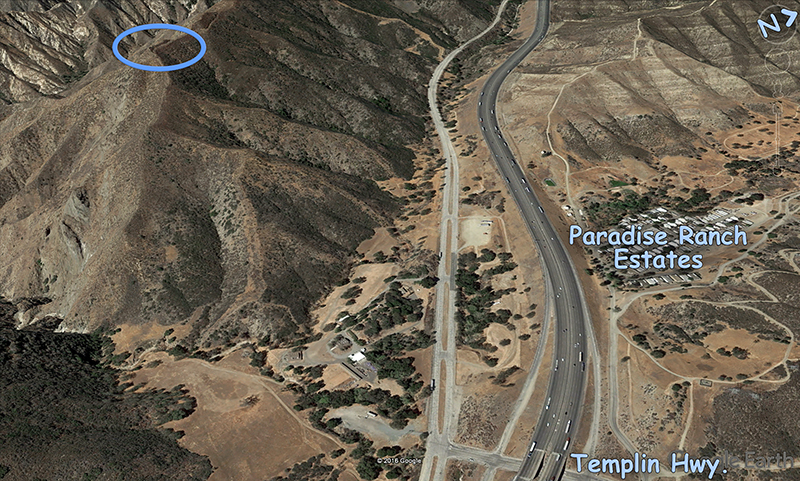 There are several known villages and seasonal encampments in the Castaic area, but none adjacent to this earth oven. The nearest known habitation sites, notably CA-LAN-324, are 2-3 air miles away. * Two fires broke out locally on Labor Day 2006. USDA Forest Service firefighters named the first one the Labor fire, so they named the second one the Day fire. The former was out in fairly short order; the latter turned into the 11th largest fire in California history, burning for a month and consuming 162,702 acres in the Angeles and Los Padres National Forests.